Cherevichki (Russian: Черевички, Cherevichki, Čerevički, The Slippers; alternative renderings are The Little Shoes, The Tsarina's Slippers, The Empress's Slippers, The Golden Slippers, The Little Slippers, Les caprices d'Oxane, and Gli stivaletti) is a comic-fantastic opera in 4 acts, 8 scenes, by Pyotr Ilyich Tchaikovsky. It was composed in 1885 in Maidanovo, Russia. The libretto was written by Yakov Polonsky, and is based on the story "Christmas Eve", part of a collection called Evenings on a Farm Near Dikanka, by Nikolai Gogol. The opera is a revision of Tchaikovsky's earlier opera Vakula the Smith. The work was first performed in 1887 in Moscow. The opera was composed between February and April 1885 at Maidanovo. Both Vakula the Smith and Cherevichki were set to Polonsky's libretto, which was originally intended for Alexander Serov, but had remained unused on account of his death. Additions and revisions for this second version were made by the composer and Nikolay Chayev. The main thematic material of the second version of the opera is the same as in Vakula the Smith. The alterations were caused by a wish to help the opera "out of the river of oblivion" (letter by Tchaikovsky of 4 March 1885). The editing primarily simplified some elements of musical texture. The lyric sphere of the opera was deepened by the introduction of a new aria inserted for Vakula: Slyshit li devitsa serdtse tvoe... (Who knows, my girl, if your heart can feel my pain...). But the addition of the song of the School Teacher and the verses of His Highness enrich the genre part of the opera. Tchaikovsky also changed the cast of the chorus scenes, as in No. 13 (Kolyadka). The premiere was given on 31 January 1887 [OS January 19] at the Bolshoi Theatre in Moscow conducted by Tchaikovsky (it was his debut as a conductor) with stage direction by A. I. Bartsal and scenic design by K. F. Valts. During the 20th century the opera was performed very rarely, revived almost exclusively within Russia and the USSR. It received its Polish premiere in the Baltic Opera House in Gdańsk on 28 June 1952. Wexford Festival Opera presented five performances of a new production in October 1993. It was shown in the United Kingdom for the first time at Garsington Opera on 26 June 2004, and then at The Royal Opera House Covent Garden on 20 November 2009 (one of the later performances was broadcast). 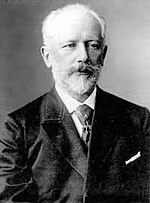 Some numbers were also arranged for voices with piano or for piano duet (4 hands) by Tchaikovsky in 1885. The widow Solokha agrees to help the Devil steal the moon. The Devil is annoyed with Solokha's son Vakula who painted an icon mocking him. The Devil decides to create a snowstorm to prevent Vakula from seeing his beloved Oxana. While the storm rages, Solokha rides up to the sky and steals the moon, while Oxana's father Chub and the Deacon are unable to find their way. Oxana is alone and lonely at home. She passes through several moods and the music follows her with gradually accelerating tempos. At one point, Vakula enters and watches her admiring herself. She teases him, and he says he loves her. Chub comes back out of the storm, and Vakula, not recognizing him, chases him out by striking him. Seeing what he has done, Oxana sends Vakula away in a miserable state. Young people from the village come around singing Ukrainian Christmas carols. Oxana realizes she still loves Vakula. In a peculiar and amusing first scene three men and the Devil wind up in three sacks at Solokha's hut after successively trying to seduce her, and Vakula winds up hauling the heavy sacks away. Outside three groups of carollers contend. Oxana shames Vakula into getting her the Tsaritsa's boots or else she won't marry him. He runs threatening suicide, leaving two bags which turn out to have the Deacon and Chub. A forest sprite warns water nymphs that Vakula is coming and that he wants to commit suicide. The Devil jumps out of Vakula's sack and tries to get his soul in exchange for Oxana but Vakula instead climbs on the Devil's back. Vakula forces the Devil to take him to St. Petersburg. The Devil puts down Vakula in the tsaritsa's court and disappears into the fireplace. Vakula joins a group of cossacks who are going to see the tsaritsa. In the hall of columns, a chorus sings the tsaritsa's praises, a polonaise. Vakula requests the tsaritsa's boots in a minuet, and it is granted because it is an unusual and amusing thing to ask. The Devil takes Vakula away as Russian and Cossack dances commence. The Act opens in the town square on a bright Christmas morning. Solokha and Oxana think Vakula has drowned himself, and mourn for him. Oxana runs off weeping when villagers invite her to the Christmas feast. Vakula returns with the boots, asks Chub to forgive him for the beating and asks for Oxana's hand in marriage. She enters, tells Vakula that she wants him, not the silly boots. Chub calls for the kobzari (the lutenists), and everyone celebrates. Rimsky-Korsakov's Christmas Eve, Tchaikovsky's Vakula the Smith, and its revision, Cherevichki, are all based on the same story by Gogol. This page was last edited on 11 December 2018, at 00:26 (UTC).